Wow. Randy Briley's talent continues to amaze me. I reviewed his picturebook not long ago, if you recall. And then I got myself a copy of his short novel, Mr. Underneath. I would place this book for ages 9 or 10 and up. All I could think while I was reading it was, I would have been putting this one in a place of honor on my shelf when I was a kid. I LOVED this kind of thing when I was young, and it's so hard to find a creepy, but not too scary book done well. (I haven't read 'Coraline', I know there are some great creepyish kiddo books out there that I have yet to read!) This one is legitimately creepy, but doesn't go over the edge. I was super impressed with the world that was created in this book. 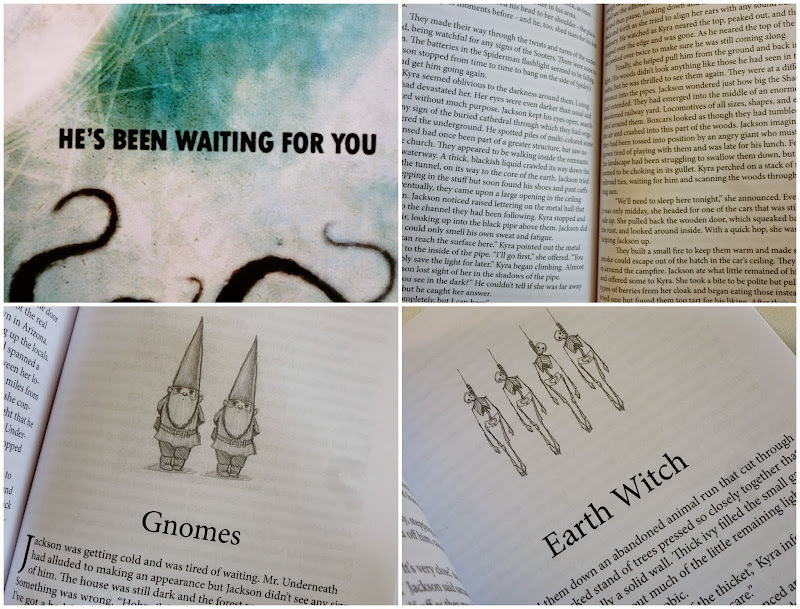 For a relatively short novel, it was densely packed with all sorts of bizarre creatures, BAD FAIRIES, ghouls, gnomes (wait till you find out what's up with the gnomes), robotic monsters (or are they?) and a shapeshifting girl who aids the young hero in his quest to rescue his parents from Mr. Underneath, who is.....just bad. So I'm like, supposed to be an adult right? And my heart was racing during certain scenes! (The keys! The keys!) The pacing was just right, and I was really struck by the amount of little details that Briley infuses into his writing. This is a fun one, my spookies, and just right for autumn! Yay! I really enjoyed this book. Love, love, love spooky kids' books! Sounds goood. But you must promise us to check out Coraline. It's one you and Julia can enjoy together. The audio is pretty fab too. Neil is a great narrator. oh i will, i will! can't wait to read that one! Just looking at the cover picture creeps me out! *hides under blanket* If the story scared you, I think it might be too much for my fragile self LOL Everybody who has seen my Mini Lalaloopsy dolls told me to watch and read Coraline. I have not yet done so... maybe I am afraid that the dolls will creep me out after that! Very cool! I read Kevin Emerson's, Oliver Nocturne series but had to take a short break because I got scared! Ha! I had a chance to tell him that and he thought that was cool. Of course, I'm a complete scaredy cat. What a great cover for Mr. Underneath. Intriguing but definitely creepy! I completely argee-- the world he created-- the creatures-- the bad fairies (which are like so perfect!!) it is wonderful!! But please please tell me, settle this debate: which is scarier-- the spiders or the gnomes? ?